NSW Metro has claimed a 60-run win against ACT/NSW Country in the 50-over Final at the Cricket Australia Under 18 National Championships in Ballarat today. Needing to chase down NSW Metro's 197 for victory, it was a disastrous start for ACT/NSW Country who lost star opening batter Sarah Young (4) in the first over, bringing Anika Learoyd to the crease early. Learoyd formed a solid 38-run opening stand with opener Alisa Bates (16), the pair absorbing the pressure as they set about dragging their side back into the game. When Bates was caught off the bowling of Isabelle Arafas (2-17), NSW Metro was back on top. NSW Metro claimed the momentum, with spinners Arafas and Isabella Malgioglio (2-29) taking control of the game in the middle overs to have ACT/NSW Country 6-108. While Learoyd was still at the crease there was hope for ACT/NSW Country, but not long after she passed 50 disaster struck and a mix up saw her run out for 54. With Learoyd back in the sheds, Metro didn't take long to finish off the tail, claiming the final three wickets and a convincing 60-run win. Earlier in the day, Country captain Anita Handono won the toss and elected to field, the decision paying dividends early with Allison McGrath removing both openers to have NSW Metro reeling at 2-21. Hayley Silver Holmes (25) went about rebuilding the Metro innings, with the big hitting top order batter threatening to produce another outstanding knock. However, the ACT/NSW Country again struck twice to put NSW Metro well on the back foot, with a wicket to Jessica Davidson followed by a run out just four balls later seeing Metro struggling at 4-57. With her side well and truly in trouble, captain Hannah Darlington (51) produced her most important innings of the Championships, combining with all rounder Angelina Genford (45) they went about repairing the innings. 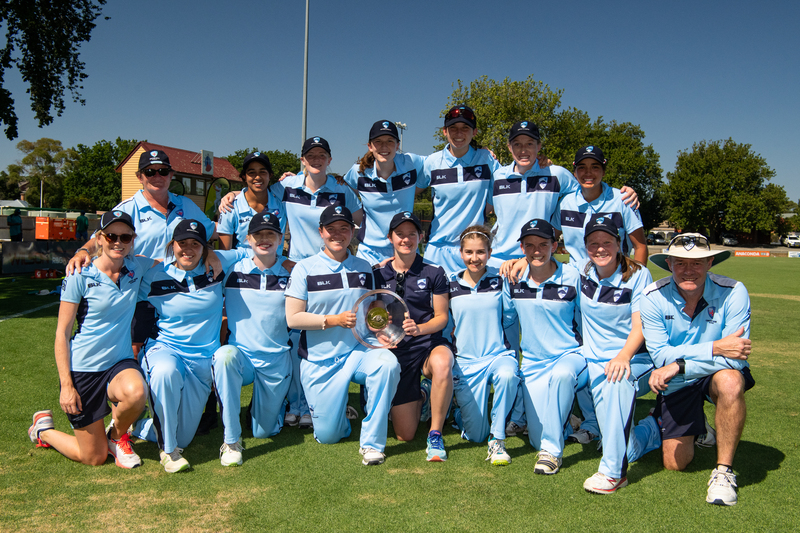 In a sublime stand of 69, the duo put the pressure back on the ACT/NSW Country as Darlington paired power and poise on her way to a well made 51, giving her side the opportunity to really attack in the latter stages. It took a fine piece of work in the field by Sarah Young to break the stand and stop the Metro onslaught, but Genford took over the reigns and began to play more extravagantly, as she carried the tail with a gritty 45 to see her side to a solid first innings total of 9-196. McGrath was the pick of the bowlers for ACT/NSW Country claiming figures of 3-34 from her 10 overs, whilst Davidson was also brilliant taking 2-12 from her seven overs. Elsewhere in Ballarat, South Australia, Victoria Country, Queensland and Victoria Metro all claimed wins to end their Championship campaigns on a high. Playing off for third place, Queensland were at their brilliant best with both bat and ball to claim a resounding 95-run win. Charli Knott and Courtney Sippel where the standouts with the bat, with their scores of 62 and 57 respectively serving as the foundation of their big first innings score of 260. Late order contributions from Caitlin Mair (18) and Emma Jackson (12) would also be critical for the Queensland in the final overs as they completely blew the CA XI out of the water Kate Peterson would be the pick of the bowlers for the CA XI, with the opener producing an impressive spell of 4-46 from eight overs. In reply the CA XI would never get going as early wickets saw them behind the pace early. Phoebe Litchfield continued her excellent form with a well made 24, whilst Georgia Voll was also impressive with 24. With the ball Neve Lynch was the pick for Queensland, with the spinner claiming figures of 4-26 to end her championships on a high. South Australia were at their brilliant best, smashing the Northern Territory by 172 runs to claim seventh position in the 50 over competition. Katie Rowe (69) hit her second half century of the championships to get her side off to a flying start, before Emma De Broughe took over with a brutal 70 off 65 to see her side to a monstrous total of 7-268. Rachel Church also showed her class with 35 of her own, as Northern Territory could do little to stop the onslaught. Faced with a daunting 269 for victory, Northern Territory would hardly make the South Australians sweat as they would continue their dominant form with ball in hand. Tarlee Meaney would be the standout of the second innings, finishing with extraordinary figures of 4-1 to clean up the tail. Victoria Metro enjoyed a big win over Tasmania to finish their underwhelming championships on a high. It was a team effort from Victoria Metro with the bat, with Hailey Ferris (33), Annabel Sutherland (27), Tess Flintoff (39) and Caitlin Morando (20) all making meaningful contributions to the final total of 209. In reply, Tasmania would again struggle to get going as some excellent team bowling from the Metro quick saw them skittled for a lowly 89. Erika Quinn would be star of the show with the ball, as she continued her good form with a excellent spell of 4-28 from her eight overs. Victoria Country would avoid the bottom of the ladder with their first win of the 50 over competition against Western Australia. Merinda Hale would be the star for Country with the bat, ending her excellent championships with 43 to build the foundation of a solid first innings score. She would accompanied well by wicket keeper Jaide Anthony, who put together an entertaining 39 to help propel the total and put pressure on the Western Australian bowlers. Charlotte Cooke would be the pick of the bowlers with figures of 3-16, whilst Sonia Yadav was also impressive with 3-30 from her 10 overs. In what was set to be an intriguing run chase, Yadav would transfer her form from bat to ball as the opener played brilliantly for 31 as she looked to get her team off to a good start. However, wickets at regular intervals would halt the progress of the Western Australian’s with Hale coming into the attack to good effect as she took 3-11 to run through the middle order. Some late hitting by Georgie Ireland (25) would give Country a scare, but they would end up being too good running away 39 run winners.